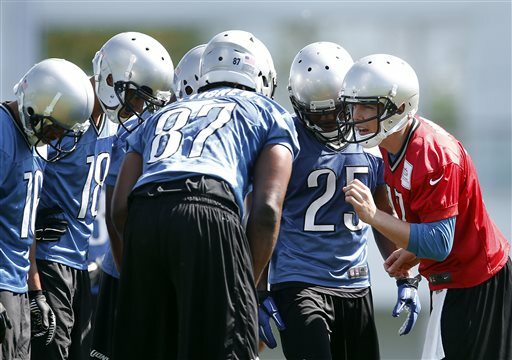 When there are nearly 90 on the Detroit Lions roster, some guys can get a little lost. Michael Williams made the move from tight end to tackle before the 2014 season. He didn’t get any game time at the position but impressed in practice. 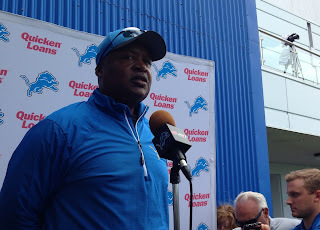 Coach Jim Caldwell and offensive coordinator have praised him up and down. In minicamp he got some reps with the starters at right tackle with LaAdrian Waddle and Cornelius Lucas out with injuries. George Winn seems to just make plays. The running back had a solid camp a year ago. Unfortunately he lost two fumbles in preseason games so he was named to practice squad to start the season. He was elevated to the 53-man roster although mostly played on special teams. He’s a bulldog, could be good on short-yardage plays. Zach Zenner ran for more than 2,000 yards in each of his last three seasons at South Dakota State and amazingly didn’t get drafted. He’s got a motor and was noticeable throughout minicamp and OTAs. He could be in a battle for the final running back roster spot with Winn. He also could be put on the practice squad to get a little seasoning. Larry Webster seems to be a favorite of Caldwell’s and, of course, that’s a good thing. He’s really worked on adding muscle and yet has maintained his speed off the edge. The 6-foot-7 young defensive end (who is versatile to move inside in some packages) was a fourth-round pick in 2014 out of Bloomsburg. His dad, Larry Webster Jr., was an NFL defensive tackle. While Ziggy Ansah and Jason Jones will likely start on the outside, he should be in the rotation on Sundays. Josh Wilson, a veteran cornerback, was quietly signed as a free agent. He is in the mix to start in the slot on the nickel package along with rookie Quandre Diggs. He has eight years of NFL experience and played in all 16 games for the Atlanta Falcons in 2014 with four starts. He has good durability — he also played in 16 games a season for the Washington Redskins for three seasons (2011-2013). After finishing 28th in the NFL in the run game in 2014, there’s not much room to go but up. The Lions have made personnel moves to get the run game in gear and coach Jim Caldwell hasn’t hesitated to say it must improve. The whole offense should be better in the second year of the new scheme. Everyone should know his role. They have basically traded Reggie Bush, who had trouble staying healthy in 2014, for rookie Ameer Abdullah who had 4,500 career rushing yards at Nebraska against Big Ten defenses. Abdullah has been impressive in OTAs and minicamp. It’s tough to judge running backs without pads on, but wouldn’t expect his stock to completely plummet. Joique Bell is another year wiser too. It’s expected he’ll be healthy enough to participate in training camp after just watching OTAs and minicamp. Bell and Abdullah can form a good one-two punch. The offensive line appears to have been upgraded. It’s still a line in flux, but it looks like Travis Swanson will take over at center and either Manny Ramirez or first-round pick Laken Tomlinson at left guard. Also (and I know this sounds like a broken record) but the other linemen understand this new offense better too. Right guard Larry Warford said people don’t understand the complexities of the offensive line. He said it was a tough adjustment last year for the line and everyone else but they are feeling much more comfortable so far this offseason. Expect more emphasis to be put on running the ball. Offensive coordinator Joe Lombardi has said he wants to unleash Matthew Stafford more often. To do that he needs the run game to be effective, to keep defenses in the box and open up the game downfield. Like every team in every sport, leadership is important among players. James Ihedigbo starts his second season in Detroit. The starting safety has not been shy. He walks in the room and you know he’s a leader. Glover Quin and Ihedigbo form quite a pair. Both are NFL veterans that chose to sign with the Lions. Both are not just leaders in the secondary, but also for the whole defense. 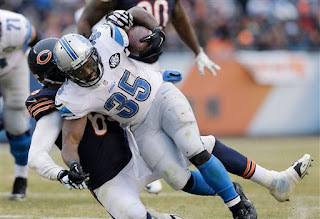 Stephen Tulloch was signed by the Lions in 2011, one of the qualities they Lions liked was his leadership. 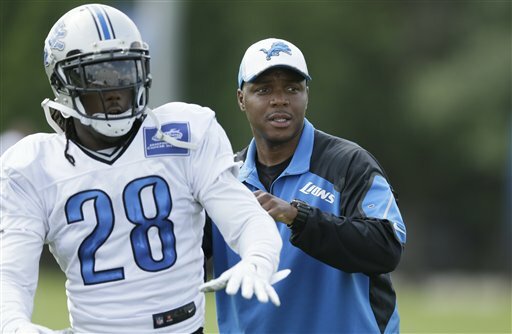 He had played for former coach Jim Schwartz in Tennessee so Tulloch’s natural leadership was no surprise. Rashean Mathis will be 35 in August, he just doesn’t play like it. The cornerback was signed for depth in August 2013 and since then has started 29 games. Plus, he shares his knowledge. He has been key in the development of Darius Slay. “He’s tireless. He’s a very effective teacher, outstanding performer, but there’s probably not a time where you see him standing over there and he’s not talking to one of those other defensive backs, whether it’s a safety and talking about a call back there, working out between the split of a receiver, or just talking to some of the younger corners and just talking to them about work habits and body position and technique and fundamentals,’’ Caldwell said. As Kellen Moore prepares for his fourth training camp, he is for the first time in the mix to become the Detroit Lions’ No. 2 quarterback. It’s between him and veteran Dan Orlovsky. He has improved as time goes along. “What we’ve seen from him is kind of what we anticipate when you have a guy that has the talent, anticipation and work habits that he does. He’s improved, he’s gotten better, so it will be a nice battle I think in the fall to kind of see what happens. 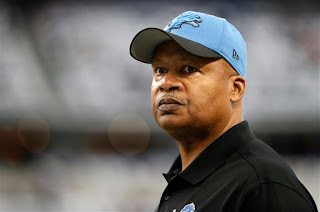 But I think he’ll be right in the thick of things,’’ coach Jim Caldwell said. Moore, like the others has a better grasp of the offense that was installed last year. “You know, he has a good understanding of our offense as well. 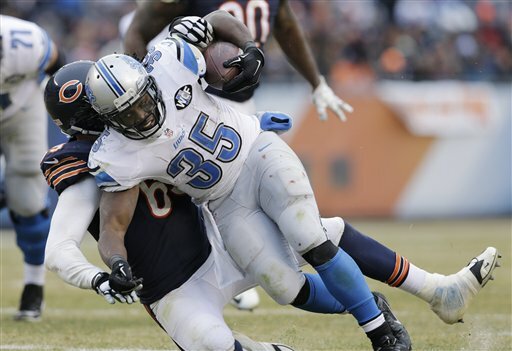 He has some unusual traits and he’s getting better all the time,’’ Caldwell said. He doesn’t have the arm of Stafford but he can get the ball down field. In the preseason games in 2014 he proved he can move the offense. Yes, it was against second and third-line defenses but he was working with second and third-tier teammates too. He has zero, zip experience in a regular season NFL game. But, hey, everyone has to start sometime. Preseason games aren’t the same, but it’s close. If he has a good training camp, look for him to be second off the bench instead of third in the preseason contests. Orlovsky does have NFL experience, but hasn’t thrown an NFL pass since he played in one game with Tampa Bay in 2012. Throughout OTAs and minicamp, he regularly split the reps with the twos with Orlovsky. That was the first sign that something could be brewing. 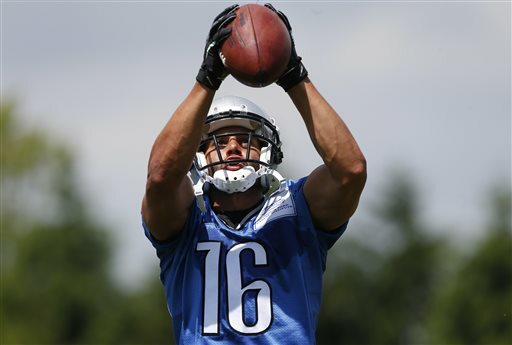 When the Detroit Lions signed wide receiver Lance Moore as a free agent, it was greeted mostly with a yawn. Then the media saw him on the field looking smooth. Then his new teammates started talking about the 31-year-old veteran. He can catch the ball. He has a knack for getting separation from defensive backs. It’s a special and crucial trait. He’s got enough speed and he’s got great hands. Much has been made of his knowledge of the Lions offense. He played for the New Orleans Saints for seven seasons through 2013. That offense is quite similar to the one installed a year ago by coach Jim Caldwell and offensive coordinator Joe Lombardi. So not only does he know the routes, he can help other Lions wide receiver — even Calvin Johnson — understand them. And, yes, it’s big but still he has to catch the ball which he does. He’s good at helping out his new teammates. It’s not like he’s keeping all this knowledge to himself. He was cheap, signing a one-year $1.05 million deal plus he didn’t play much for Steelers last year so his legs are relatively fresh. 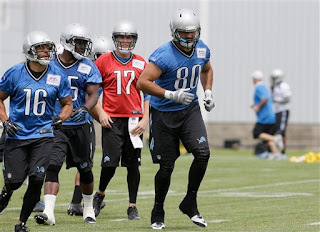 Moore has worked with Ryan Broyles and Ameer Abdullah returning kicks and punts. So he could have double value. Don’t look now but that 2014 Detroit Lions draft class is starting to look quite impressive. It could produce three starters this season — tight end Eric Ebron, center Travis Swanson and possibly defensive tackle Caraun Reid. When coach Jim Caldwell was asked on Thursday about the impressive physical development of Reid, he talked him up big-time, but he also mentioned a few others. 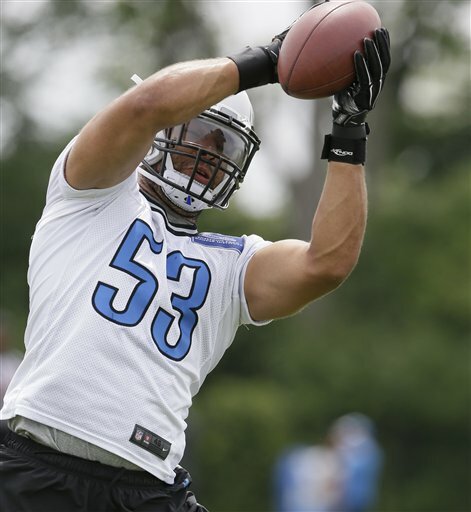 Van Noy, a pass-rushing specialist, was a second-round pick who was injured during the preseason. He played mostly special teams when he came back for the final eight games. Webster was considered a bit of a project when drafted in the fourth round out of Bloomsburg. He was a basketball player who had played only two years of college football. He made the 53-man roster, but was only activated for two games and then didn’t see playing time. Still he impressed coaches during practices last season and now even more. It's likely Ziggy Ansah and Jason Jones will start at defensive end, but Webster has a good shot at being in the rotation. Also from the 2014 draft class, wide receiver TJ Jones, a sixth-round pick, had a solid week of minicamp and could be in a battle for a wide receiver position. Cornerback Nevin Lawson, a fourth-round pick, is coming off a severe foot injury and hasn’t been able to do much yet. He was impressive as a rookie briefly before his injury in the second regular season game. If seven of the eight picks from the 2014 draft make the 53-man roster, general manager Martin Mayhew deserves much credit. The only member of that draft class no longer with the team is kicker Nate Freese who was the seventh-round pick. He was cut early last season. ALLEN PARK — Cornerback Bill Bentley was cut by the Detroit Lions on Thursday after the final minicamp session. Bentley was trying to come back from ACL surgery after injuring his knee in the regular season opener in 2014. He was out the full season. He had not participated in team drills throughout minicamp and organized team activities. Out of training camp last year the third-year corner had won the starting nickel spot. Bentley, who was a third-round draft pick in 2012, played in 44 games in last three seasons with eight starts and 33 tackles. From minicamp and OTAs, it appears Josh Wilson and rookie Quandre Diggs will battle for the starting position in the slot during training camp. 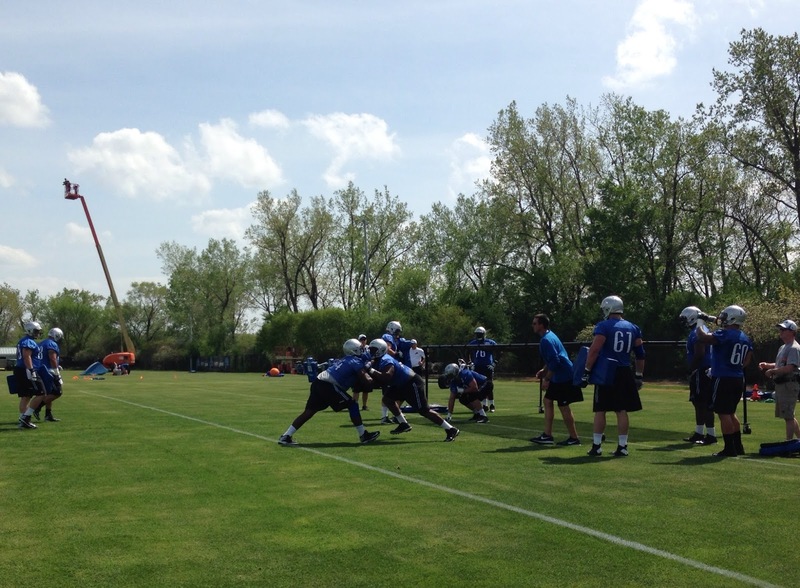 Lions offensive line works at Thursday's minicamp. Calvin Johnson said he feels good and is a good place right now. He’s participated in all three days of minicamp. Matthew Stafford said no question the offense has taken strides forward and now they have to continue it and bring it back to get going at training camp in six weeks. Stafford also said he doesn’t think much about the playoff loss at Dallas. “In this business If you’re thinking about what was you have issues. 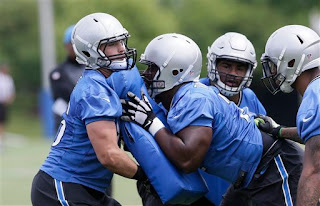 You have to think about obviously be present and try to get better that day and think about what’s ahead of you, what’s coming up,’’ Stafford said. Jason Jones was absent for third straight day. Coach Jim Caldwell would not be specific on the injury but said it’s been taken care of. No big surprises on the field on Thursday. Still heavy rotations. Manny Ramirez takes reps at starting left guard. First-round pick Laken Tomlinson will have to beat him to earn the start. Michael Williams was at right tackle with the starters. Cornelius Lucas and LaAdrian Waddle remain out. 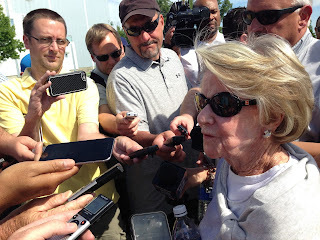 Owner Martha Firestone Ford was on the sidelines watching for the second time in three days. Darius Slay picked off a pass from Matthew Stafford intended for Golden Tate. It was a rare interception for Stafford. 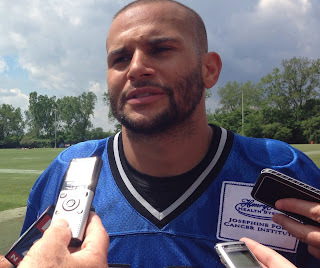 Working on returns were Ryan Broyles, TJ Jones, Ameer Abdullah and Lance Moore. Caldwell wouldn’t share his thoughts on sending the team off for six weeks. But says his line on the “low cost of high living” is a constant reminder. ALLEN PARK — If you missed Thursday's live chat, check out the transcript here. We talked about rookies, draft classes, the defensive line and much more after the Lions wrapped up their three-day minicamp. Quarterbacks Kellen Moore and Dan Orlovsky continue to rotate reps with the offensive’s second unit. Moore threw with the twos on Wednesday, after Orlovsky did so on Tuesday. It was a little odd to see Calvin Johnson briefly as a cornerback on the scout team. Seventh-round pick Corey Robinson got reps with the first unit at right tackle. Cornelius Lucas and LaAdrian Waddle remain out. Michael Williams took the same reps on Tuesday. First-round pick Laken Tomlinson who usually lines up at left guard with the second unit, did so on Wednesday. But he also got some reps at right guard. Manny Ramirez has been lining up with starters at left guard. Defensive end Devin Taylor lined up at tackle on some packages during team drills. He said he had no idea what the plan is for him once the season starts. Jason Jones was absent for the second straight day. Wide receiver TJ Jones, who missed his rookie season with a shoulder injury, had a solid day again, turning heads by pulling in leaping catch and then he caught a 50-yard plus pass from Orlovsky. Rookie running back Ameer Abdullah said he’s been learning a ton from Joique Bell who has not been practicing while coming off surgery. Kicker Matt Prater asked for the skinny goal posts and got them to work on his accuracy. 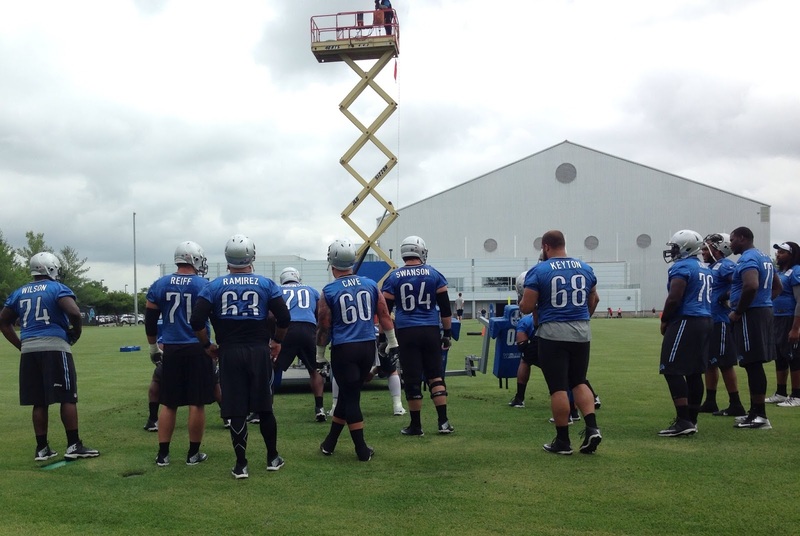 Again defensive tackle Reid Caraun lined up next to Haloti Ngata in team drills. Ford, the Detroit Lions owner, talked to Ndamukong Suh urging him to stay in Detroit before he signed with the Miami Dolphins in March. Ford is a regular at Lions offseason practices and was on the sidelines again on Tuesday for the first day of minicamp. She talked to the media formally for the first time since her husband, William Clay Ford, died in March 2014. 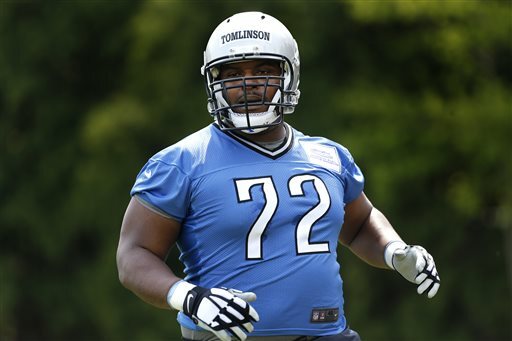 ALLEN PARK — First-round pick Laken Tomlinson has signed his rookie contract with the Detroit Lions. The official announcement was made late Thursday afternoon. Tomlinson’s deal is for four years with a team option for a fifth year. It’s estimated to be worth $8 million according to the rookie wage scale. He was the 28th overall pick in the draft. Tomlinson could start at left guard where there is an opening since the Lions did not re-sign Rob Sims. It’s not a certainty he will start there but he’ll have a chance to make his case in training camp. Veteran Manny Ramirez, who was acquired in a trade on the first day of the draft, has taken reps with the starters at left guard and at center in the OTAs. All of the Lions’ seven 2015 draft picks have now been signed. The Lions wrap up their OTAs today (Thursday). A three-day mandatory minicamp starts on Tuesday. 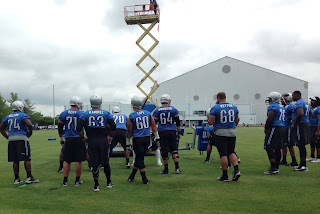 If you missed the weekly Lions chat today (Thursday), check out the transcript here. 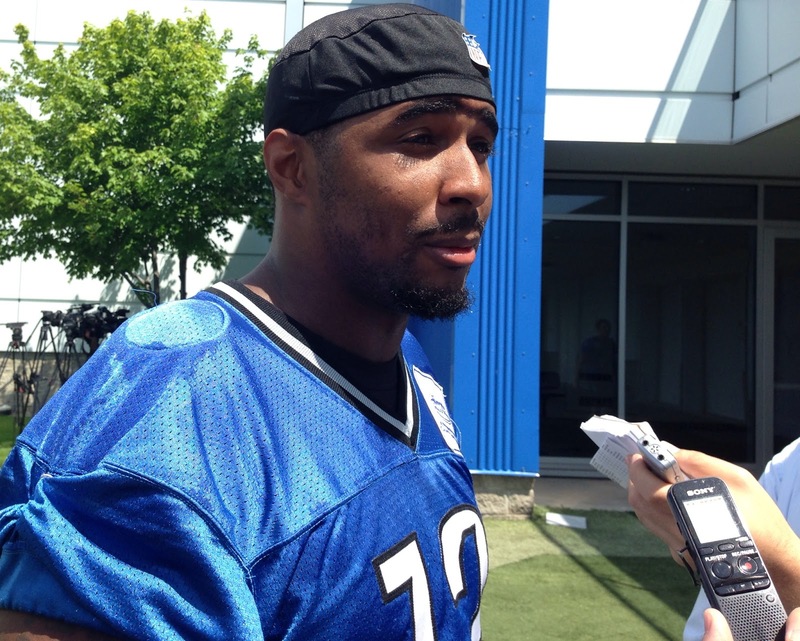 It seems there is plenty of concern about the depth at the defensive tackle position and praise for Ameer Abdullah. Bring your comments and questions to the next chat at 3 p.m. on Thursday, June 18, which is also the final day of mandatory minicamp. Second-round pick running back Ameer Abdullah runs smoothly and ran with starters at times. There’s a lot of mixing and matching on the offense. “One of the things that … he does a lot of things well for a young guy, but one that thing you notice quickly is he can catch the ball. He catches it and knows what to do with it when he gets it in his hands. He’s making good progress,’’ coach Jim Caldwell said. Caraun Reid, second-year defensive tackle, continues to impress Caldwell who saw him alone in the indoor facility early one morning working on his own just like Ndamukong Suh used to do. Cornerback Alex Carter, the third round pick, is getting “baptized” in his first week of OTAs. He couldn’t attend the previous two weeks because he was finished his junior year at Stanford. 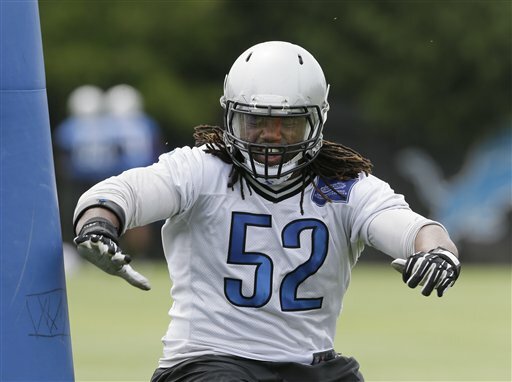 The Lions sent him videos of drills to work on so he was able to keep up to some extent. 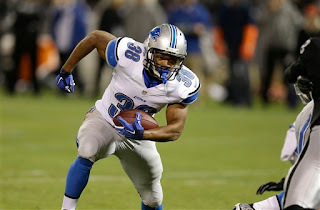 Ryan Broyles was absent and Caldwell said it was for personal reasons. Broyles and his wife Mary Beth welcomed their first child on Saturday — Sebastien Reid Broyles. Kellen Moore and Dan Orlovsky were sharing the reps for the No. 2 quarterback. Caldwell reminded again there is no depth chart just a rep chart. Manny Ramirez lined up at left guard with the starters in team drills. Travis Swanson at center is doing “awesome” according to offensive coordinator Joe Lombardi. LaAdrian Waddle and Joique Bell still are watching their teammates on the field but not practicing. Haloti Ngata is still absent. OTAs are voluntary and he didn’t participate last week either. Caldwell said Ngata has some personal things to attend to. The Lions' defense is not new to Ngata because the Ravens used the same system. The mystery of the barefoot-running quarterbacks has been solved. Turns out Dan Orlovsky was just trying to trick the media. ALLEN PARK — It’s been the big question the first three weeks of Detroit Lions’ organized team activities: Why do the quarterbacks run barefoot after each session? For the answer Matthew Stafford and Kellen Moore have referred the media to offensive coordinator Joe Lombardi. Finally, today (Wednesday), Lombardi talked to the media and it was the first question he was asked. “I get blamed for that?” Lombardi asked. “I think that was Dan Orlovsky. When he sees you guys out there he says, ‘Let’s run barefoot.’ I think he’s tricking you on that one,’’ Lombardi said. “Matt sometimes get blisters so when they run after practice I think he likes to take his shoes off if his feet are hurting,’’ Lombardi added. There’s no magic formula to running without shoes. “I’ve read it’s good for you but I would never make them do it,’’ Lombardi said. Offensive players have said they’re way ahead of last year at this point and Lombardi agrees. Eddie Murray has a different perspective on the changes to the extra point that will be tried out in the NFL for one season starting in September. That’s because he was an NFL kicker for 19 years. His first dozen were spent with the Detroit Lions. 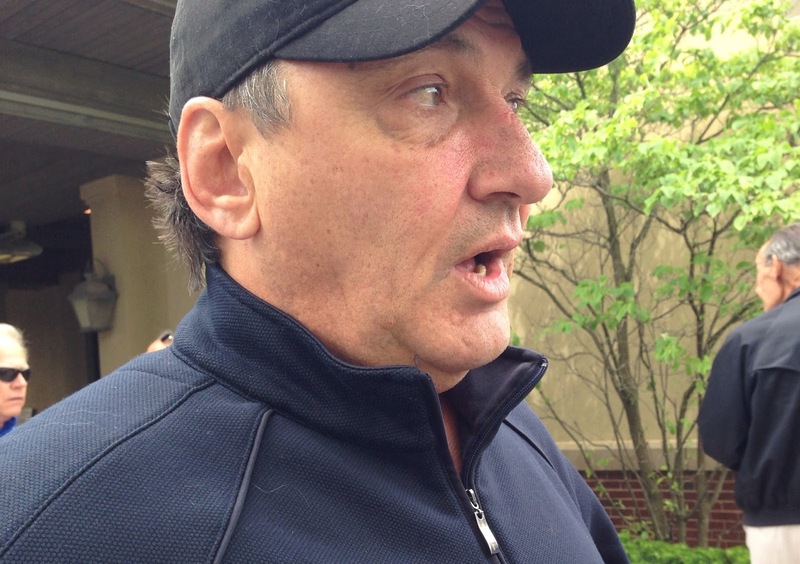 Eddie Murray speaks at Charlie Sanders golf outing on June 1. He likes the new rule which will add 13 yards to the extra point effectively making it a 33-yard field goal. The efficiency rate for extra points was 99.6 for the past three years in the NFL. In other words, just too automatic. In his career Murray was 98.7 accurate on extra points and had a career percentage of 75.5 for field goals. From 1991-2000 (the stats were not broken down until then) his accuracy on field goals between 20 and 29 yards was 97.3 while from 30 to 39 yards he had an accuracy of 76.7 percent. He was a two-time Pro Bowl kicker and a member of the 1980s NFL all-decade team. He won a Super Bowl ring with the 1993 Dallas Cowboys. While he’s good with the new rule, he wants to see how it plays out. “If it gets to a point where now all of a sudden it becomes a touchdown and you have to go for 2 points I think it takes away from the essence of the game,’’ Murray said last week at the Charlie Sanders golf outing. Even with the change to the extra point, the recent changes in kickoffs and the possibility the goal posts could be narrowed, Murray does not think the NFL will eliminate kickers from the game. “I would be surprised if they do that. It’s funny, that they try kickers have become very proficient at their craft. I came into the league when there were still straight-on guys,’’ said Murray who was drafted by the Lions in 1980. He came into the NFL with other kickers who use the soccer style. “Now you look at Matt Stover has had a helluva year and (Adam) Vinatieri has done exceptionally well. There are some great kickers who have done exceptionally well at kicking footballs and they’re trying to make it harder, it’s just part of football,’’ Murray said. “They’re all trying to finagle something. “I still think you need someone to kick a field goal and kick an extra point. To totally eliminate it I think would really cheapen the game,’’ he added. He’ll never forget kindness shown to him by the late Al Davis of the Oakland Raiders. That’s why Caldwell has college and high school coaches in to watch practices. There were several at Thursday’s OTAs. “I, on one hand, believe in it because of the fact that these men, whatever level, obviously there are no pro coaches here, but colleges, high schools, I think it’s incumbent upon us to give these guys an opportunity to come in and kind of see how we do, what we do. I was a young coach in 1981 I think it might have been. I used to go visit pro teams during the summer. Some pro teams wouldn’t let you in. One team that I had heard would let me in was the Oakland Raiders. I called, Al Davis let me come in and he spent three days with me. He walked around with me personally. I was coaching the defensive backs at that time trying to find out about bump-and-run coverage. There were two teams that were playing great bump-and-run coverage in the pros – Kansas City Chiefs and the Oakland Raiders. You had Lester (Hayes) on the corner out there and Mike Haynes and all those guys that played well. I think Jack Stanton might have been the secondary coach, but he took time with me, walked me around at practice. He never left my side at practice. We’d walk over there with drill work, go through it and at night time he’d come back in at night and he and I would watch film from 10 o’clock at night until the wee hours of the morning. Go back to the hotel, get some sleep, come back and do it all over again. Three days in a row, and this was a guy who was running the whole operation. So, from that experience I really believe in allowing guys to come in and see what we do. I think that’s the way it should be. It helped me out tremendously in my career.” Caldwell said he’d like to spend more time with all the coaches. He did find time for Tom Arth, the head coach at John Carroll. Arth played quarterback for Caldwell with the Indianapolis Colts. In that meeting Caldwell said there was plenty of give and take. Caldwell’s golf handicap? “Severe,’’ he said at the Charlie Sanders charity golf outing on Monday. It’s a good sign for fans when a coach is not a scratch golfer. Means he’s spending more time at the facility and less on the links. The Lions have completed six of their 10 allotted sessions of organized team activities. Wide receiver Lance Moore has legitimate shot to make the 53-man roster. He may be 31, but he finds a way to get separation and catch the ball. He knows the offense from his seasons with the Saints and can help other wide receivers with the routes. But the Lions won’t keep him around unless he can catch the ball and so far, so good. No depth chart yet, it’s more of a rep chart. With a few openings at key positions, they are trying out a variety of players. Only two OTAs have been open to the media, but there were changes from one to the other. It’s early. Almost two months until training camp starts. Not so fast on inking Travis Swanson as the starting center. It could happen, but it’s not for certain. Manny Ramirez, who has vastly more experience, lined up at center and at guard on Thursday. While first-round pick Laken Tomlinson seems almost (key word) a sure bet for left guard and Riley Reiff will hold down left tackle there is competition for the other starting spots. With LaAdrian Waddle sidelined (following ACL surgery), Cornelius Lucas is getting starting reps at right tackle. In other words, many questions on offensive line. Kellen Moore continues to take reps with the second group. It’s a continuing sign that at he has a solid chance at the No. 2 quarterback position. The return gig is still way up in the air. Different guys are getting shots. Jeremy Ross wasn’t in the mix on Thursday but he was last week. Ryan Broyles wasn’t getting return reps last week but he was on Thursday. It seems the staff under Caldwell has a knack for getting the best out of each player and they will think out of the box to reach that goal. Proof? They moved Xavier Proctor to offensive tackle from defensive tackle. He was on practice squad and so impressed coaches when he had to line up on offense (due to lack of bodies) in practice last year that they opted to move him. Players on both sides of the ball have indicated that they are way ahead of last year at this time. They were learning the new schemes and really just getting rolling. Now they have a year under their belt and seem more comfortable — don’t have to think so much, can just play. That is huge. Plus they can pay more attention to the details. Also huge. Other than Haloti Ngata, there is not much experience at defensive tackle but there seems to be good competition with Caraun Reid, Tyrunn Walker and Gabe Wright in the mix among others. The Lions could be looking to see what they have before signing another veteran defensive tackle. Cornerback Quandre Diggs, who has taken reps with the ones and twos in the slot, continues to impress with his intensity. Matthew Stafford mentioned he has noticed Diggs’ competitiveness. In my chat this week had questions about the disappointing draft class including Ameer Abdullah and Alex Carter. Their words, not mine. Patience, people. 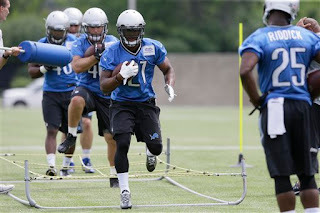 Abdullah is just getting started and looks fine in OTAs. Carter is finishing up classes at Stanford and hasn’t taken the field yet. Give them a chance. The Lions will wrap up OTAs next week and then have a mandatory minicamp June 16-18 before taking a break prior to training camp.